Our paint parties are always a blast. 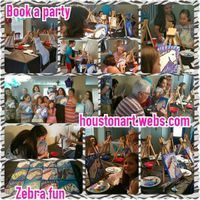 We host paint parties for all ages 3 and above, our parties are mobile. All parties include step by step instruction from an art instructor, with the use of a canvas, easels, brushes, aprons, and paint. A $25 deposit is required to book your event and a completed application must be submitted on time. Please note that mobile parties do not include table and chair set up. Additonal fees may apply. 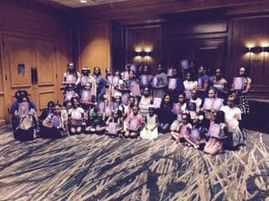 You can inquire about our mobile paint parties online at the "Book Parties or Art Class" tab. . We are NOT a free paint facility. We are mobile only. Please review the FAQ tab for more information about our paint party policies. Also, we do offer paint parties in spanish! Partes de pintura se ofrecen en español. Contáctenos hoy mismo para obtener más información! 45 to 90 minutes of step by step instruction with one of our artists. $265 for up to 10 kids. $190 for up to 6 guest. 60 minutes to 90 minutes of step by step insruction with one of our artists. Do you need a craft rather than a painting project for younger children? We can make this an available option if needed. Check out our paint and jewerly parties too. 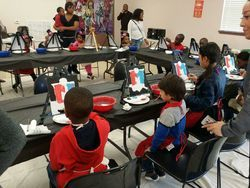 Parties include all the fun that comes with a paint party, in addition to a jewlery making lesson too! Children's who enjoy art will enjoy this party deal as kids have fun with paint and get to create some jewelry to add to the fun. A deposit is required to book your event. Please note that mobile parties do not include table and chair set up. We do guarantee 100% and a fun-energetic party for your children's next event! Book online today! 90 minutes of step by step instruction with two instructors. Have questions on party booking? Contact us today or click on the "book Parties or Art Class" tab to book online. .